Oops - we don't appear to have a video for the DR-2580C. Most of our staff have these machines on their desk (25) and scan all incoming post and documents onto our case management system. They just keep on rolling day after day without problems. Three now need replacing but only because they are old and worn them out! So far as we are concerned there is no other choise and I am putting in my order now. I bought this scanner after a bad experience with the Canon DR-2510c, which kept misfeeding on stacks of A4 paper. The DR-2580c is basically the same scanner but takes the paper in horizontally and I have been using it extensively and it has not misfed once. Important: This scanner only takes 50 sheets at a time, not 100 as claimed! Tradescanners could not have been more helpful in replacing the first scanner with this one. We each have one on our desk (43 in all) and scan incoming post onto our case management system every day. They are first rate machines with few problems. We are just about to order another 4. The Canon DR-2580 is still rocking and rolling after more than 220,000 scans (so the software tells me) in the past six months. I now have two extra networked hard drives, and considerably more elbow room. The time it took was minimal - load the feeder, choose a profile you've pre-set for the material, and re-load a few minutes later, or whenever you're passing the machine. Misfeeds are rare, and only once has it caught me out by feeding two pages instead of one. If you scan without the OCR, and then OCR overnight, the workflow is even quicker. Very solid and very impressive piece of kit. The scanner is used as a backup to a larger more robust scanner of the same make. It is reliable and the scan quality is good, perhaps a little better than the larger one we have. It is slightly small however and struggles to handle high volume. In these cases it tends to skew some items. Overall a good scanner for low volume work. Small, and compact, the scanner has worked very well to date, without any double feeding problems. Numerous pages of accounts can be loaded at one time, and scanning is extremely quick. The scanner is very easy use and the software that comes with it is very straight forward and easy. Full duplex scanning speed even at high resolutions is impressive. The paper can get jammed really easily if you are not careful. One thing I have noticed when observing people using the scanner is that if the documents are not held in place by the user in the scanner then there is a tendency for the paper to twist as it is fed into the scanner. This twisting can then lead to paper jams as each consecutive page becomes slightly more twisted. Out of the box I was surprised how compact it was which, was a bonus, as we need to take it on-site with the rest of our IT equipment. Simple to operate and the numbers quoted in the spec are accurate, which is always a welcome relief. It works perfectly in tandem with out OMR software package and when we need to buy more document scanners, I won’t be shopping around. 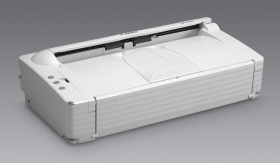 This ultra compact scanner has a very small footprint, so it fits neatly on your desk or even on a tiny counter top. Sleek and stylish, with an ergonomic design, you'll hardly notice it at all - until you need productive scanning that's right at your fingertips. Take advantage of the one workgroup scanner that fits the tightest spaces as well as the tightest budgets. Convenient A4 scanning is just the start with the Canon DR-2580C document management scanner. It can handle small plastic cards, very thick and thin paper such as payment slips, all types of forms and a range of other materials - thanks to the addition of a special straight paper path. Whatever work you deal with, this smart and versatile scanner manages all applications smoothly and effortlessly. Cut down scanning time and increase productivity with the DR-2580C. Scan all your black and white or greyscale documents at a rapid 25 pages per minute* and colour work at 13 pages per minute*. Double-sided documents can be scanned just as quickly - at 50 images per minute* for mono and greyscale and 26 images per minute* for colour. It's the easiest way to enjoy faster scanning in a smaller space. Get high quality scans every time, even for difficult documents with shading and colour contrasts. The DR-2580C can capture the most intricate image details with a high optical resolution reaching up to 600 dpi. Auto shading adjustment helps provide stable and high quality scanned images. Plus a Colour Dropout feature automatically removes red, green or blue for far more efficient forms processing.